I needed to destroy something. The feeling would not go away. I had been struggling with it since yesterday afternoon, when I sat in therapy and imagined ripping my own skin off. The thoughts continued to play in my mind, and it took everything in me not to comply. But I still needed to hurt, I needed to destroy, I needed to do something to get this feeling to go away. I sat in the break room at work, too weak from throwing up all morning to make my way home, but too lost in my feelings to trust myself to go anywhere else. I wanted it all to go away, but sitting in silence just made it come on stronger. I started looking through my folder. I keep my notes from therapy there, as well the letters I’ve written to people, and important papers I need to work through. I was looking for one of my grounding reminders when I came across the envelope of religious crap my mother had sent me. I kept it because I wasn’t sure of what to do with it. I was waiting for the right time to set it all on fire, but in that moment, I didn’t think I could wait. I needed to destroy something, so I chose that. I tore each card into pieces. I cut the plastic stained glass window with a knife. First into strips, then into squares, then into tiny flecks. It was relieving. All of my focus shifted from destroying myself to destroying these things that my mother used to help destroy me. I took the pieces I tore and tore them up again and again, until the pieces were so small that I could not tear them anymore. I became so immersed in this pointless destruction that I completely forgot about my own need to self-destruct. Three hours later, I was done. I threw it all in the trash like confetti. All except for one thing: a picture from 1994, which had been pasted on a religious announcement. I peeled the photo off, quite easily, before tearing the rest of the card to pieces. Pieces of my childhood, completely destroyed. But they weren’t really pieces of anything, except the lies my mother used to tell me. The only true piece of my childhood was in that photo. I sat there and looked at it Curly blond hair. I know I had curly blond hair. Big glasses. I knew my vision was poor. My name and date on the back. 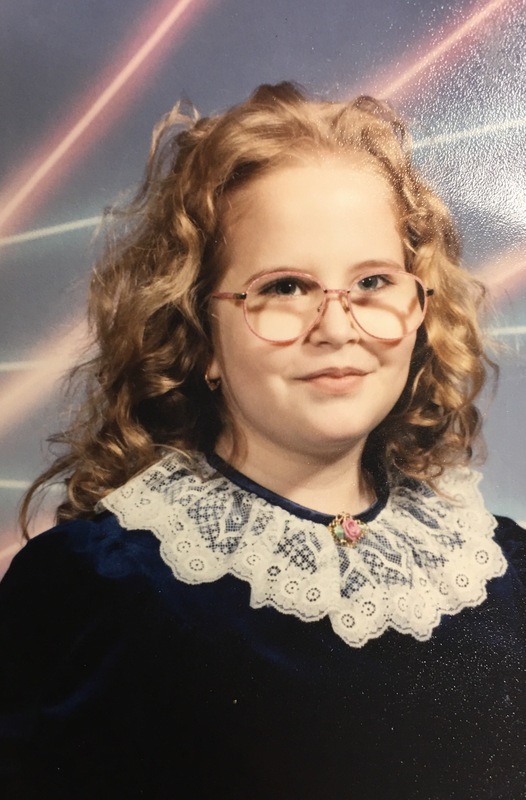 This photograph is of 8 year-old me. But why was I having so much trouble realizing this? It was like I was looking at a picture of a stranger. I know this is me, but not inherently. I can rarely look at a picture and recognize my self looking back at me. I’m so disconnected with those parts of my life that I don’t even realize those parts are me. And then the realization hits. This is me. I sat there and cried. Seemingly over a picture, but it wasn’t really the picture at all. I was crying for that little girl. That little girl I couldn’t connect with. That little girl who was holding in so much, at just eight years old. I tried to look in her eyes. I tried to look for a sign that someone else could have seen. But I couldn’t see anything. Just a girl in a dress, forced to crack a smile for a school picture. No one could see the pain she was in. No one could see the fear she felt. No one could see the shame she was already carrying with her, in this picture, and every day before and after. No one could see. No one wanted to see. I cry for that little girl. I cry for the horrible things I know she went through. I cry for how confused she must have felt — to be told that mommies love their children, but not knowing that love is not supposed to hurt like it did, not knowing that her mother never really loved her. I cry for how strong and brave she had to be. I cry for the childhood she lost, the childhood she never got to have. I cry for 8 year-old KJ. But I don’t want to cry for me. We’re different people, aren’t we? Oh my gosh this was so powerful! 8 year old KJ is just beautiful. She deserved so much better than what she got. So much better. She is beautiful, thank you for letting her know. She deserved the world. No, you aren’t different people. You’re just not tightly connected right now, and that’s okay. Maybe that helps protect you now, your grown-up self, who has a lot to deal with as she builds her independent life. Maybe you aren’t quite ready to fully identify with the 8-year-old girl. But with your compassionate heart and your tears, it is clear you can empathize with you. You know what pain she was experiencing, though it wasn’t visible on her pretty young face. And you care about her. You don’t reject her. That’s why I think there will be a time when you will feel she IS you. She is smart and loving, and those characteristics as well as the pain she experienced and her strong will to survive all contributed to shaping the amazing person you are today. One time when I really wanted to hurt myself, and the impulse was one of rage, I called E. She suggested I destroy something in a way that wouldn’t be dangerous but would be very physical. I ended up in my bedroom ripping up old magazines and catalogs. Some of them were hard to rip, and so much the better! I actually worked up a sweat and made quite a mess. It was satisfying and took care of that impulse to harm myself. I think your detailed destruction of the religious cards probably served the same purpose, or maybe better because they also had an emotional significance. This is such a positive way to express those feelings while also protecting yourself. You are such a lovely person, KJ. You at age 8 and you now, both of you. I had never torn anything up like that before (en masse). It did help tremendously, and like you said, the things that were hard to rip (which I was wrong in thinking that 20+ years would make paper more fragile — it did not) were more relieving to destroy. I’m afraid that in those times I can’t connect to the other parts of me, that I am hurting those parts in some way, denying their reality even though I know what they experienced, but I’m denying the connection they have to me. I don’t even know if that makes sense. I feel like it’s not enough. Give it time, dear. It may take a while, but that’s okay. You’ve already done the best possible thing for those parts, by getting them away from the witch.